The UD research team aims to develop new nanostructures that act like a ratchet to combine the energy of two red photons of light into a single blue photon, which has higher energy. Such an advance could improve solar cell efficiency to chemotherapy treatments. 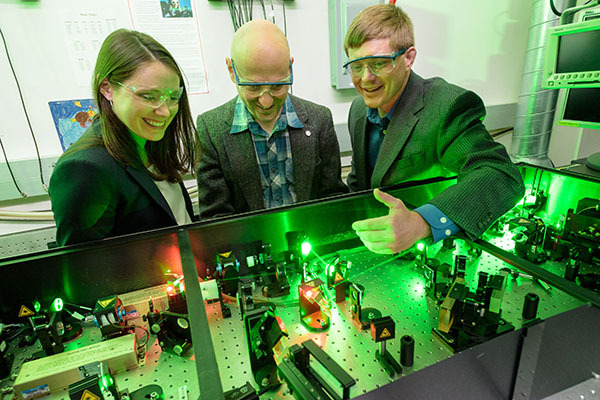 From right, Matthew Doty, Joshua Zide and Diane Sellers examine the ultrafast laser system in Doty's lab, which will be used to probe the structure and properties of materials developed in their research. 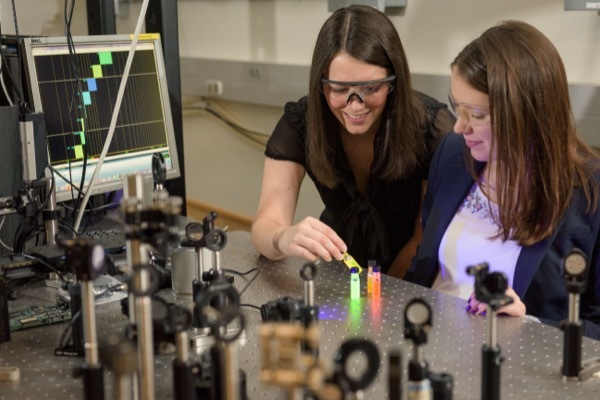 Emily Day (left), assistant professor of biomedical engineering, and Diane Sellers, postdoctoral researcher in materials science and engineering, examine vials containing solutions of fluorescent quantum dots. 11:33 a.m., July 23, 2015--Researchers at the University of Delaware have received a $1 million grant from the W.M. Keck Foundation to explore a new idea that could improve solar cells, medical imaging and even cancer treatments. Simply put, they want to change the color of light. They won’t be tinkering with what you see out your window: no purple days or chartreuse nights, no edits to rainbows and blazing sunsets. Their goal is to turn low-energy colors of light, such as red, into higher-energy colors, like blue or green. 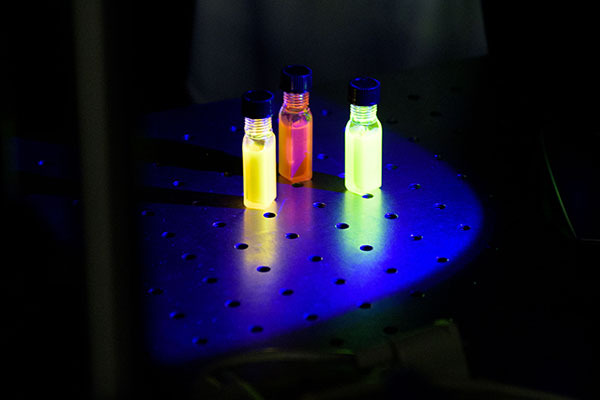 Changing the color of light would give solar technology a considerable boost. A traditional solar cell can only absorb light with energy above a certain threshold. Infrared light passes right through, its energy untapped. However, if that low-energy light could be transformed into higher-energy light, a solar cell could absorb much more of the sun’s clean, free, abundant energy. The team predicts that their novel approach could increase the efficiency of commercial solar cells by 25 to 30 percent. The research team, based in UD’s College of Engineering, is led by Matthew Doty, associate professor of materials science and engineering and associate director of UD’s Nanofabrication Facility. Doty’s co-investigators include Joshua Zide, Diane Sellers and Chris Kloxin, all in the Department of Materials Science and Engineering; and Emily Day and John Slater, both in the Department of Biomedical Engineering. This process, called “photon upconversion,” isn’t new, Doty says. However, the UD team’s approach to it is. They want to design a new kind of semiconductor nanostructure that will act like a ratchet. It will absorb two red photons, one after the other, to push an electron into an excited state when it can emit a single high-energy (blue) photon. The UD team will develop new semiconductor structures containing multiple layers of different materials, such as aluminum arsenide and gallium bismuth arsenide, each only a few nanometers thick. This “tailored landscape” will control the flow of electrons into states with varying potential energy, turning once-wasted photons into useful energy. The UD team has shown theoretically that their semiconductors could reach an upconversion efficiency of 86 percent, which would be a vast improvement over the 36 percent efficiency demonstrated by today’s best materials. What’s more, Doty says, the amount of light absorbed and energy emitted by the structures could be customized for a variety of applications, from lightbulbs to laser-guided surgery. How do you even begin to make structures so tiny they can only be seen with an electron microscope? In one technique the UD team will use, called molecular beam epitaxy, nanostructures will be built by depositing layers of atoms one at a time. Each structure will be tested to see how well it absorbs and emits light, and the results will be used to tailor the structure to improve performance. The researchers also will develop a milk-like solution filled with millions of identical individual nanoparticles, each one containing multiple layers of different materials. The multiple layers of this structure, like multiple candy shells in an M&M, will implement the photon ratchet idea. Through such work, the team envisions a future upconversion “paint” that could be easily applied to solar cells, windows and other commercial products. While the initial focus of the three-year project will be on improving solar energy harvesting, the team also will explore biomedical applications. A number of diagnostic tests and medical treatments, ranging from CT and PET scans to chemotherapy, rely on the release of fluorescent dyes and pharmaceutical drugs. Ideally, such payloads are delivered both at specific disease sites and at specific times, but this is hard to control in practice. The UD team aims to develop an upconversion nanoparticle that can be triggered by light to release its payload. The goal is to achieve the controlled release of drug therapies even deep within diseased human tissue while reducing the peripheral damage to normal tissue by minimizing the laser power required. Based in Los Angeles, the W.M. Keck Foundation was established in 1954 by the late W.M. Keck, founder of the Superior Oil Company. The foundation’s grant making is focused primarily on pioneering efforts in the areas of medical research, science and engineering, and undergraduate education. The foundation also maintains a Southern California Grant Program that provides support for the Los Angeles community, with a special emphasis on children and youth. For more information, visit the website. Tracing its heritage to 1743, UD is a state-assisted, privately controlled institution with an enrollment of more than 22,000 students. The University offers an extensive array of undergraduate and graduate programs across seven colleges. The Carnegie Foundation for the Advancement of Teaching classifies UD as a research university with very high research activity  a designation held by fewer than 3 percent of U.S. colleges and universities. UD also is a 2015 recipient of the Carnegie Community Engagement classification in recognition of its deep commitment to public service.